South Boulder Peak is the tallest of the peaks in the Boulder Group just west of Boulder, Colorado upon which the famous Flatirons lie. It is also the highest of the six major peaks in the Boulder Open Space and Mountain Parks. From south to north these are 1. Eldorado Mountain, 2. South Boulder Peak, 3. Bear Peak, 4. Green Mountain, 5. Flagstaff Mountain, and 6. Mount Sanitas. For all this lofty altitude, however, it is visible from only a few places in town; from most angles, the nearly-as-tall and impressively pointy Bear Peak shields it from view. Although close to Boulder, South Boulder Peak will provide more solitude than nearby Bear Peak or Green Mountain. Also, with over 1,000 feet of topographical prominence, South Boulder Peak is the 343rd most prominent peak in the state of Colorado. This is one of the standard northern approaches to South Boulder Peak but requires climbing up and over Bear Peak first. It is well covered in the Bear Peak section. Total mileage from NCAR to South Boulder Peak is about 3.5 miles one way with a very stiff but scenic climb up Fern Canyon and the north ridge of Bear Peak. 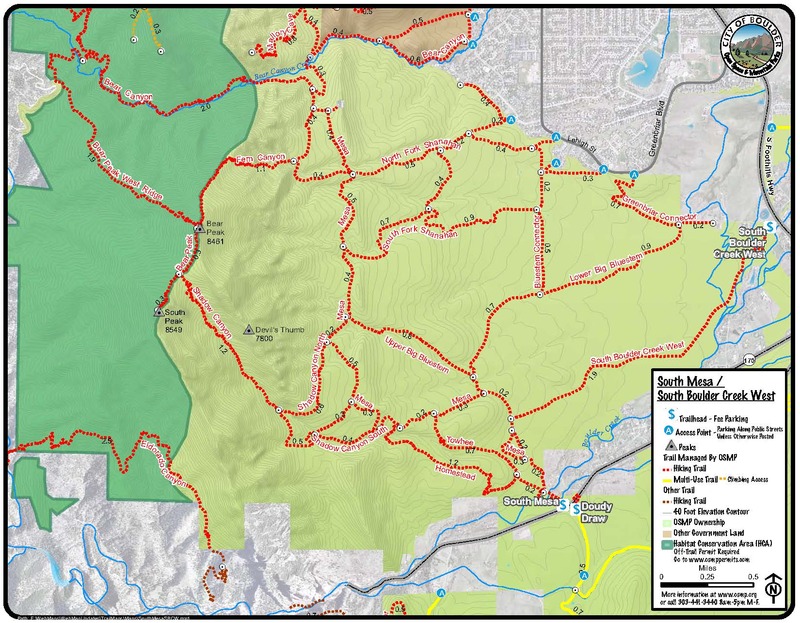 There are no parking fees or permits necessary except for the South Mesa & South Boulder Creek West Trailheads which both require a $5 parking fee. Dogs are allowed in most areas but should be kept on leashes at all times. Bears and mountain lions frequent many areas of the park. Occasionally, trails will be closed for excessive bear or lion activity.